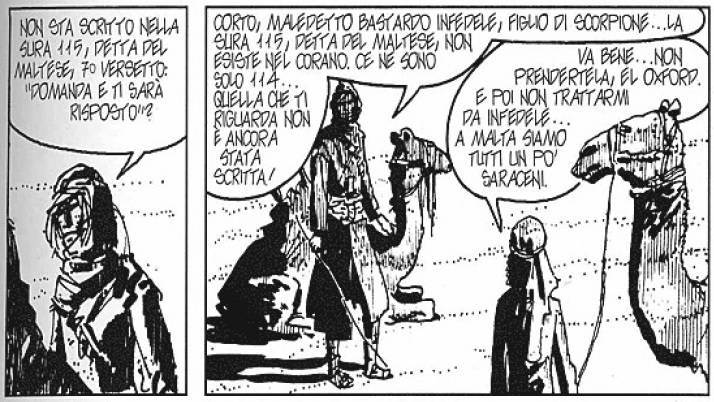 Every student of Arabic and Islamic culture, art, philosophy… that has spent at least one month studying or doing research in Venice has read the wonderful graphic novel by Hugo Pratt Favola di Venezia – Sirat al-Bunduqiyya. And of course I did when I was studying there. On Dec, 4th (2014) a video-game based on the novel will be released, thus, I started feeling the need to pay my tribute to Hugo Pratt, in my way. 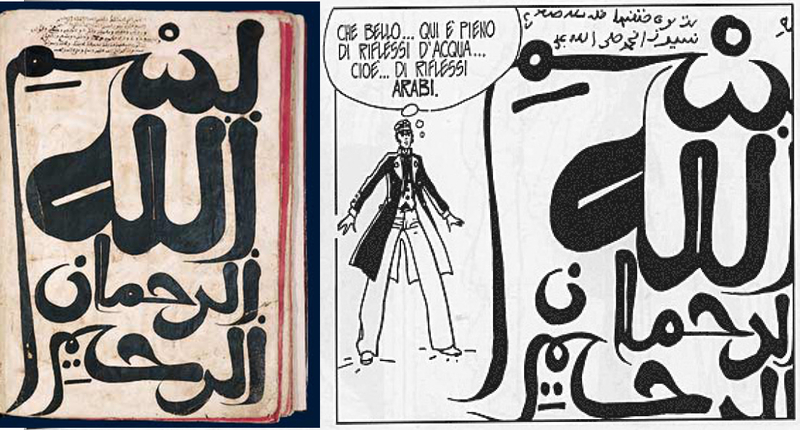 In many cases Corto Maltese and his adventures contain Arab-Islamic references. The most obvious, easy to say, is Au nom d’Allah le très miséricordieux, le compatissant” (In the Name of Allah the Merciful) where just from the beginning we find a great number of Qur’anic quotations, and we are even introduced to the 115th sura: the Sura Maltese. In Sirat al-Bunduqiyya things are different. In the story not only Islamic elements are involved, but also the general atmosphere recalls Arab-Islamic culture. Corto Maltese is in Venice to solve a riddle that his friend Baron Corvo sent him before passing away. He has to find the Clavicle of Salomon, a magic emerald, a bereket, that arrived in Venice through a long travel around the Mediterranean cultures. The exact story of the Clavicle is told by Melchisedech, a wise Jew living in the ghetto: Satan gives the emerald to Lilith (‘Adam’s first wife’), then the stone is given to Cain, who loses it when trying to re-conquer the Eden. Then it is owned by Salomon. With Salomon the stone becomes the reward for one of his architect, named Iram, for the erection of the Temple. In some way, Simon Magus manages to have the emerald, only to lose it because of a bet with Simon Peter, who eventually gives it to St. Mark. St. Mark brings the stone to Alexandria, Egypt, where he funds his Church. There, two assassins hired by Simon Magus kill St. Mark and bring the emerald to Antioch. Eventually, the Basileus transforms it in a gnostic stone ‘of the Abraxas type’. Easy, isn’t it? Afterwards the Clavicle is stolen and hidden somewhere in Venice. From around the Mediterranean people start to look for it, but no one manages to find it. Even Ibn Battuta tries to find his way and recover the emerald, but does not succeed. Throughout the novel, Hugo Pratt uses Islamic arts. Well, needless to say, of course he includes THE Islamic Object of Venice. The one that I love (and that is NOT the same old rock crystal ewer of the treasury of St. Mark). It is the incredible Seat of St. Peter. A throne that was made using a beautifully carved Fatimid tombstone, and that is kept in one of the oldest Venetian churches: San Pietro di Castello (far away from the touristic area). 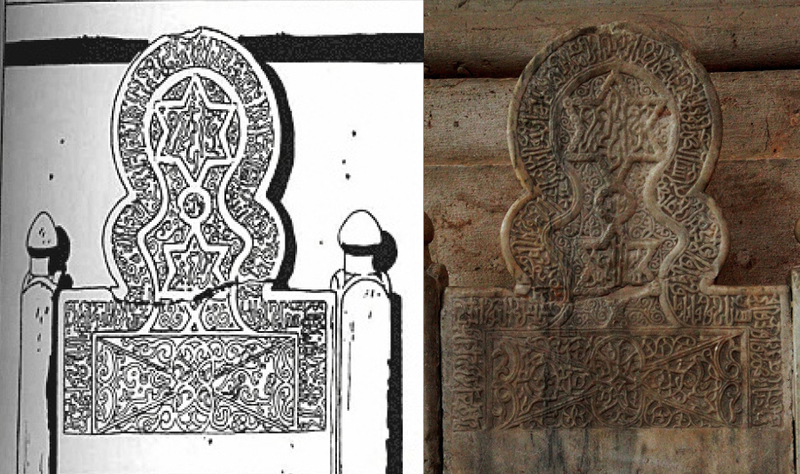 For narrative needs, the Fatimid tombstone is not considered a funerary slab, but it is considered because of its mysterious inscriptions (together with other strange runic and Nabatean inscriptions scattered around the place). Two others references to real Islamic artefacts are found in a kind of dreamlike passage, when Corto Maltese, falling from a roof, finds himself floating in a world made of “Arabic glares”. When I first read the graphic novel I didn’t notice them, or at least, I may have noticed them while reading, but couldn’t find the connection they had in the real world. The first one is easily recognizable: it is taken from a maghribi manuscript composed in 1828-1829. It is quite unique because of the huge format of the basmala and the peculiarity of the script. The second one is more difficult to identify, as only two letters (waw and alif) and a shadda are represented in the novel. It is anyway possible to think that it was taken from another manuscript, a Qur’anic one. The long curve tail of the waw and the way it is juxtaposed to the alif make it quite possible that this was the source, or alternatively a similar manuscript (maybe a folio taken from the same copy of the Holy Book). It makes sense of course that Hugo Pratt used these two manuscript (and probably others, that I was not able to identify) in the graphic novel. Both of them are connected to the Bibliothèque nationale de France. Hugo and his family moved to Paris in 1969 and since then he travelled and worked often in the city. 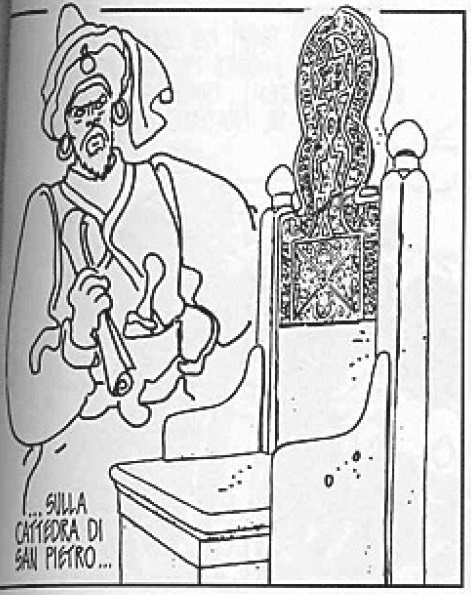 Favola di Venezia was published in 1977. Anyway, I wrote this post simply to pay my tribute to Hugo Pratt, to Venice and to Islamic Art. All combined. 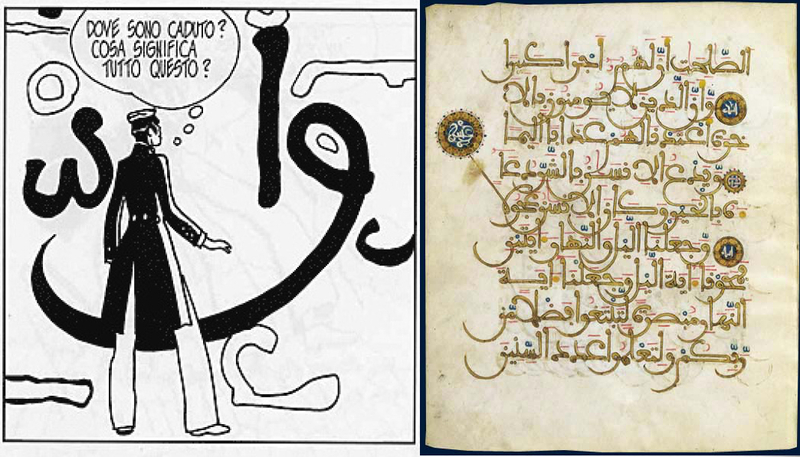 I just wanted to underline that in many ways, Corto Maltese and Sirat al-Bunduqiyya come from the strong imagination of a great artist, and yet, sometimes real objects help us to grow our own imagination. This time, some beautiful pieces of Islamic art helped building a surreal and dreamlike atmosphere. And it is important to dream. Following Corto Maltese, I went with a friend to Calle dell’Amor degli Amici, looking for the door through which you can ‘disappear forever in wonderful places and new stories’. We didn’t manage to find it, apparently. We are still in this grey world, but luckily there is something that makes it less grey. Very interesting — I love how the illustrations combine with the calligraphy. I would like to find an English copy! I am afraid that even if Corto Maltese is quite an old (but really popular) graphic novel, the old English translation seem to be out of print. I’ve read that a new translation will be published shortly, and I hope this translation would include Sirat al-Bunduqiyya! That would be cool! Even without the Sura, I’m sure it would still beat Tin Tin’s sojourn to Morocco – I was very disappointed to return to him after learning Arabic to discover that they didn’t even bother connecting the Arabic letters. Betrayal!